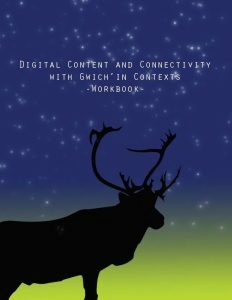 Last week the Gwich’in Tribal Council’s Department of Cultural Heritage (GTC) hosted a day-long workshop on Digital Content and Connectivity in Gwich’in communities. This pilot was designed by GTC staff and partners from the University of Alberta’s Faculty of Extension and the First Mile Connectivity Consortium. The team included Dr. Rob McMahon and Master of Arts in Communication and Technology graduate student Hanne Pearce from UAlberta, GTC Department of Culture Heritage Executive Director Sharon Snowshoe, Cultural Heritage Researcher Alestine Andre, and GTC IT Manager Suraj Chhetri. 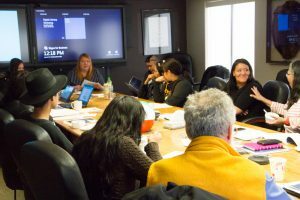 A total of 19 people participated in the workshop, including youth who travelled by road and plane from four Gwich’in communities: Fort McPherson, Tsiigehtchic, Aklavik and Inuvik. 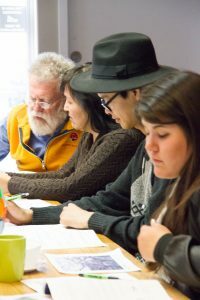 Participants from Inuvialuit communities also joined. The day-long workshop blended presentations, discussion and hands-on activities. Along with an introduction to key aspects of digital content and connectivity, it showcased Northern-based projects and innovations undertaken by GTC, including their interactive online atlas and ethnobotany database. 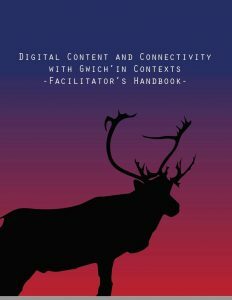 The project also generated two resources for community to conduct their own workshops: a facilitator handbook and a participant handbook. The project decided to make these resources Creative Commons, so that anyone can use them in their own work. 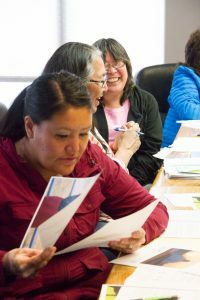 This workshop was made possible through funding support from the Government of the Northwest Territories Department of Education, Culture & Employment and Department of Industry, Tourism and Investment, and from GTC. We also acknowledge and thank UAlberta North and the School of Library and Information Studies at the University of Alberta for their support for this project. The team partners had a great time at the pilot workshop, and received good feedback from participants on how to continue developing the content and format for community-level events. 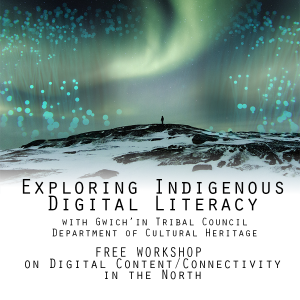 The team intends to build on this pilot workshop in the coming months, and to explore ways to develop and host local digital literacy workshops with GTC First Nations both online and face-to-face. While in Inuvik, Rob also gave a public presentation at the Aurora Research Institute about the First Mile research and projects. 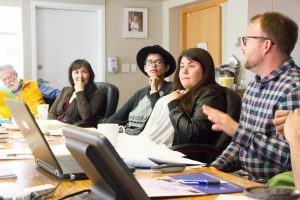 He also did an interview with CBC News about the workshop and connectivity issues in the NWT. This entry was posted in Blog, Community Stories, Current and Recent Activities, E-Learning, Education, First Mile, FMCC, FMCC News Updates, News, Research, Territories. Bookmark the permalink. ← CRTC puts an end to locked cellphones and unlocking fees ..